Peter Baxter Associates Ltd were engaged by the developer to carry out field testing of compacted fill at this medium sized housing redevelopment of an old warehouse site in Aylesford, Kent. 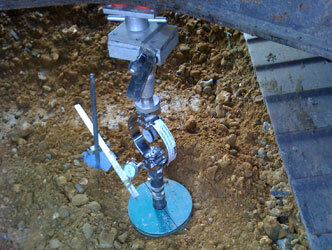 The testing comprised plate bearing tests, CBR tests and water replacement tests. PBA advised the client and their structural engineer of the suitability and compaction parameters of recycled imported fill. SITA UK Ltd have developed an existing 2700m2 warehouse building at Ridham Dock, Kent, for use as a processing plant to generate up to 950T per day of solid recovered fuel from commercial paper and plastic waste which required a Piled Floor Slab solution. This processing involves shredding, drying, metal and ceramics recovery, baling and wrapping. The equipment train imposes point loads of up to 187KN and each item of plant must be located within tight relative tolerances. There are substantial loadings from HGVs and front end loaders. The existing 1970s floor slab comprised thin concrete over 12m of soft alluvial soils and was inadequate for the proposed loadings. 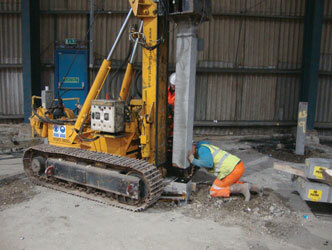 Working to a deadline imposed by the plant delivery programme, Peter Baxter Associates commissioned a quick and economic site investigation using a rig mounted dynamic cone penetrometer, to determine the depth and strength of the underlying London Clay. 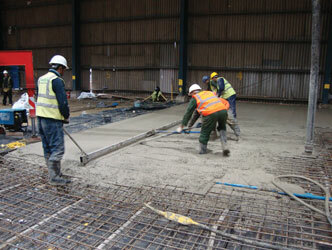 A piled floor slab was designed based on segmented precast concrete piles at 3m spacings. The load analysis was carried out using a finite element technique, and two discrete high load areas were increased in thickness. The slab was generally 270mm thick reinforced concrete C50 DS4 power floated, and cast in three areas. Peter Baxter Associates prepared tender documents based on the NEC Option B contract form, reviewed pile calculations and other contractor’s submissions, and supervised the works. 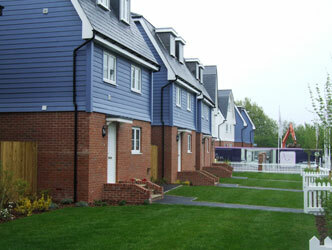 The works commenced 12th December 2011 and were completed in February 2012. The plant became fully operational in August 2012. 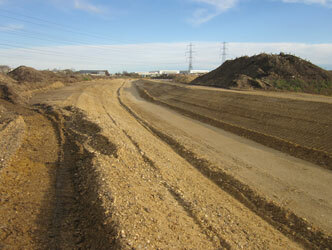 Viridor Waste Management’s Beddington Landfill Site in Croydon, South London, is crossed by a “Main Effluent Carrier” (MEC) a 4m wide concrete channel carrying treated sewage effluent to the nearby River Wandle. 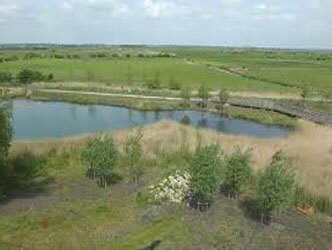 In storm conditions this channel overflows to holding lakes within Viridor’s site via an Overflow Channel. It was necessary to replace the existing 1987 channel by 2012 with one realigned to the north, in order to release space for landfill cell development. 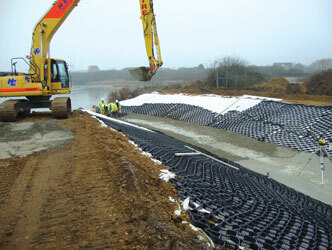 For economy and aesthetic reasons, Peter Baxter Associates selected a lining system that comprised a plastic web pinned to the subsoil and lined with screened gravel from on site deposits, as a watertight channel was not required. Dry lean concrete was used to line the web in zones where high erosion was predicted. A road crossing was constructed from precast culverts. During the site investigation, a large diameter gas main was discovered metres from its recorded position, requiring a partial redesign of the alignment. This channel will remain in legacy use as part of a landscaped park and is expected to provide a low maintenance and attractive facility for many years. Peter Baxter Associates prepared the tender documents to NEC Option B, acted as Project Manager and CDM Coordinator, and supervised and tested the works. The project was completed in February 2012 after 10 weeks construction and has coped well with the exceptionally wet conditions since. Horton Landfill Site, in the South Downs area of West Sussex, was a former clay pit supplying a nearby cement works. 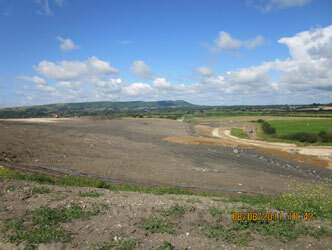 The site had been used as a landfill for many years, and landfilling was completed in the summer of 2011. 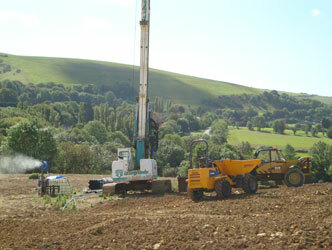 Peter Baxter Associates have been involved with this site for many years. The final phase of capping and gas infrastructure was constructed between August and December 2011, and comprised over 62,000m2 of 1m clay cap, formed largely from imported clay, with 44 new gas wells and associated collection pipework. 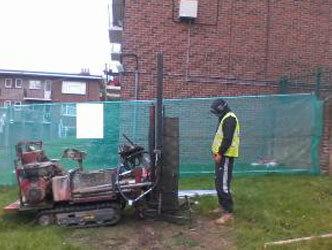 Peter Baxter Associates were retained by the operator, Viridor Waste Management, as CQA Consultant. PBA maintained a full time CQA Engineer on site, who also carried out nearly 300 density core tests on the compacted clay in an on site laboratory. This field testing regime was specified in the CQA Plan prepared by PBA, accepted by the Environment Agency, and provided cost savings to the client along with better CQA control. Check samples, and other parameters, were tested in PBA’s UKAS laboratory. PBA also prepared the tender documents and acted as the Project Manager and CDM coordinator. Peter Baxter Associates provided field testing of compacted colliery shale for a redevelopment phase at Betteshanger Colliery Enabling Works. This project involved bulk earthmoving of shale waste to form a site for a business park. On behalf of the earthworks contractor, Peter Baxter Associates negotiated a variation to the compaction and testing regime to improve production rates, and provided a full time and visiting test technician. Commercial to residential conversions have become increasingly common in recent years. 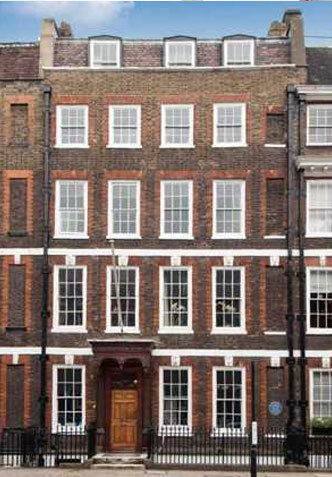 Few are as prestigious as this development in the heart of political Westminster, where a listed Queen Anne’s Gate terrace is being turned back into a single occupier house. Peter Baxter Associates Ltd acted as CDM Co-ordinator on this project, which involved some structural work and high-end finish refurbishment. Within our sphere of competence we offer CDMC services for a wide variety of projects.